It was a long weekend here this past weekend, and while our church went away for a group campout, we opted to stay home for the sake of health and sanity. Which meant that we unexpectedly had a free weekend! What should we do with our newly discovered freedom?? Sleep? Go on a trip to the mountains? Call up all our friends and have a party? (the post title kind of takes away any anticipation, does it not?) We gardened! For 4 summers we have tried to get a vegetable garden put into our yard! Our biggest holdup was the number of mature trees on our lot... and their roots. It would have been horrific trying to dig down deep enough for a garden, fighting all those roots the whole way. So we opted for a raised bed. But that meant we had to build it. Year after year we'd plan to do it, then lose track of time and next thing we knew it was August and we didn't have so much as a bean in our yard because we just never got around to building the garden. Well, at the end of last season we finally wised up and we bought all the supplies we would need to construct the raised bed this year. By having everything on hand, we really had no reason not to put in the garden this year! We already had the landscaping ties and a load of dirt that we had picked up for free last year, so the last part of the puzzle was getting the time to do it, which this weekend finally affording us. Now, I'm using the words "we" and "us" a lot, but the reality is, my husband did it all. He cut and laid the ties. He moved the daylillies that were growing in that spot to a new place by the side of the house. He dug out the sod. He went over and above and dug down 5 additional inches across the whole area so that we could have even more depth. He moved that whole load of dirt to the back, one garbage bin at a time, and he stirred in the 1/4 bail of peat moss that my mom gave to us to help enrich our soil. You see, my husband is quite protective of me. He relishes his role of being responsible for me, for my safety and my health. So after I got too much sun the other week, he laid down some expectations for me: I will not work too hard. I will not do too much. No heavy lifting until I get clearance from my doctor. No taking on rigorous chores - I must delegate to him. So I really wasn't allowed to do anything - he wouldn't let me! But, while I couldn't dig out sod, move ties, and haul dirt, I could putter around and tend to the rest of the yard. While hubby was making me a garden, I planted some lettuce and tended to my herbs, I raked out the front flower bed (we live across from a big park with huge trees and the leaves settle in our front yard - continually), and I attempted to deal with our ant issues (first cornmeal, then chili powder). I managed to get out this weekend and pick up some more plants. I bought Coral Bells and Sweet Woodruff for a raised bed we have around the base of a tree in the backyard. That bed has my strawberries, some delphiniums, a hosta that surprised me and is coming back from last year, and something that my neighbour gave me that I can't remember (I'm such a good gardener, aren't I?) The bed is also designed with some ornamental aspects, so there is a wheelbarrow upended and half-planted at the top of the bed, and rocks and broken clay pots edging it. It requires a fair bit of upkeep because grass grows up between the rocks, but it really is my best soil in the yard and I'm excited to see how it looks once that woodruff gets established. I'm anticipating redoing my front bed at the end of the season. Right now it houses a gazillion tulip bulbs - not all of which are producing currently. The soil isn't well mixed, so essentially it is sand, sitting on top of clay, so this fall I'll stir it well and replant everything in a better layout. In anticipation of that, I didn't put any annuals in it this year. I want everything in there to be placed permanently so that I can better visualize it at the end of the season. 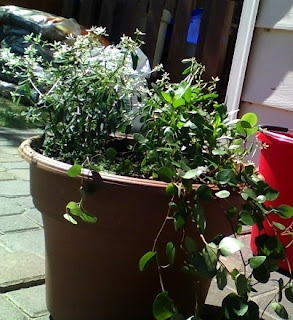 So we picked up some yarrow and a hollyhock to back our bed, and I put in a double-flowering clematis variety to climb our awning post which is sunk at the edge of our bed. That bed won't get much done to it now, but it'll take up a lot of my time come Fall. I couldn't go a whole season without any annuals; most of my favorite flowers are annuals, or not hardy in my zone. Since I wasn't going to put them in their usual spot, I decided to try container gardening. I've planted things in containers before, but only really herbs. This was going to be my first tempt at aesthetic value. I bought some Euphorbia (how could I not - it's adorable!) and decided to plan my container around that. My ideas ranged from the dramatic (tall, red flax surrounded by those dainty white flowers in the euphorbia) to the more gradual levels (tall salvia spears, ornamental grass, the euphorbia, then some trailing plant), but when I got to the greenhouse I was sad to find a lack of plants that I was looking specifically for. No flax. No blue fescue. No salvia. This greenhouse was huge! And it didn't have any of those right now. Sigh. So I had to start from nearly scratch in the middle of the store. I opted for a couple osteospermum (I love these - especially the white varieties), some pink crawling thyme and a trailing maidenhair vine. In the end it came together quite well, and the layered foliage still looks nice before everything starts blooming. Oh, and since I was using such a large, deep container, I opted to tear up some cardboard drink trays and put them in the very bottom of my planter. They'll maintain good drainage, and ensure I don't need as much soil in there. And at end of the season I can just dump them into my composter along with my planter contents and they'll break down fine. Everything went over great! So of course we needed one hiccup to come along: Our tree has a fungus called Black Knot. My neighbour just pointed it out to us this weekend and I wish we had noticed sooner; we've got at least 10 branches infected. Hopefully we can head it off and it won't take out the tree! Sure, I was okay cutting down two bulky spruce trees from our front yard a few weeks ago, but I don't want to lose my pretty mayday! Anyway, I'm glad we got so much done, even though we've still got a few things to do. Over the next few days I'm going to seed my garden (carrots, and beets, and beans, oh my! ), move a peony that's never really thrived, and plant a rose bush my hubby decided we needed to buy (I love him). But that's one of the fun things about gardening - there's always something more you can do!